Dublin, Ireland, 14th August 2012: Dublin-based MicroPro Computers’ iameco wooden tablet has been hailed as the most environmentally friendly PC in the world, according to the renowned Fraunhofer Institute of Reliability and Microintegration in Berlin, Germany. The iameco touchscreen personal computer (PC), launched in Ireland last year, will make its debut on the European market from September when it will be launched at the ELECTRONICS Goes Green conference in Berlin. The touchscreen personal computer has a carbon footprint that is 70 percent less than that of normal computers and almost 100% of all the materials used are recyclable, 20 percent of the machine can be recycled immediately as many parts can be used for repairing other computers and the wooden frame is also recyclable. Hazardous materials that would normally be used in the manufacturing process have been reduced to a minimum and replaced with alternatives that are more environmental; LED lighting has replaced conventional lighting to improve energy efficiency by 30-40% and copper tubing and heat sinks replace the traditional fans used to prevent processors from overheating cutting down on energy required to cool the PC. 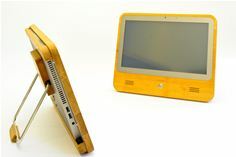 The iameco touchscreen PC, which has been designed with standard computer components ensuring that it can be updated, maintained and repaired easily, was the first computer of its class to be awarded the EU Ecolabel, denoting it as a product that has significantly reduced its impact on the environment throughout its lifecycle. The EU Ecolabel is the most difficult environmental standard to achieve and it is strictly enforced. MicroPro Computers™ is a wholly owned Irish Company with its headquarters in Dublin, carrying the Guaranteed Irish Logo, ISO 14001 and ISO 9001 certifications and is established over 20 years. Iameco™ designed by MicroPro Computers is committed to creating superior PCs and computer peripherals with the highest environmental and technical standards. For more information visit http://www.iameco.com/ or http://www.micropro.ie/.